How can compositions be implemented to minimize loss of autonomy? 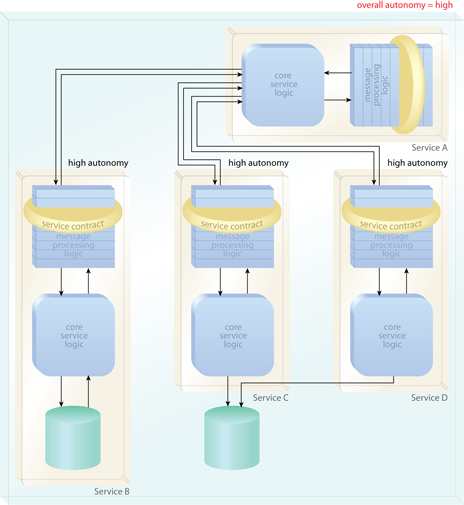 Composition controller services naturally lose autonomy when delegating processing tasks to composed services, some of which may be shared across multiple compositions. The agnostic member services of a composition are redundantly implemented in an isolated environment together with the task service. Increasing autonomy on a composition level results in increased infrastructure costs and government responsibilities. By grouping the services of a composition into a separate deployment environment, the collective autonomy is maximized because the implementation is dedicated to the composition, and none of the services are otherwise shared. Services C and D in particular benefit from this new implementation as they are no longer subject to shared access.